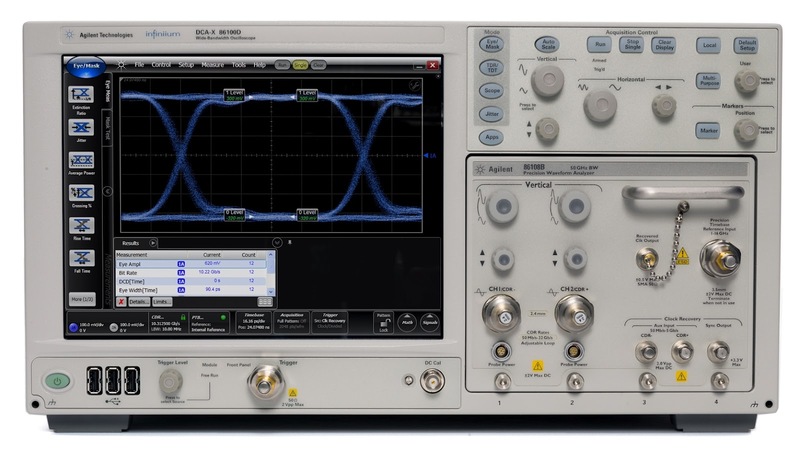 Agilent Technologies Inc. (NYSE: A) has introduced two new test applications that leverage the high bandwidth and low jitter performance of the Infiniium 86100D DCA-X oscilloscope. Agilent N1012A compliance test software is the industry's first automated application for the Optical Internetworking Forum's Common Electrical Interface (OIF CEI) 3.0 Implementation Agreement. Agilent N1019A user-defined application, on the other hand, enables engineers to rapidly develop their own automated test applications. Both software packages help developers save time and money. Increased demand for video and other data-intensive Internet services have stressed the capacity of today's networks. Operators seek fast, cost-effective ways to increase capacity, which they can achieve by using multiple lanes at 25 to 28 Gb/s. These high data rates increase the importance of flawless equipment interoperability, which necessitates more extensive equipment testing and stringent test limits. The OIF CEI 3.0 Implementation Agreement covers eight interfaces with nearly 120 tests. Several other standards also address tests at these data rates. Agilent N1012A compliance test software performs a wide range of oscilloscope-based and network analyzer-based tests for the OIF CEI 3.0 Implementation Agreement. The software also provides 5- to 28-Gb/s physical-layer transmitter measurements for engineers designing to the requirements of OIF CEI 3.0, including the 28G-VSR (very short reach) interface. Product developers can use debug mode to rapidly troubleshoot their designs. The Agilent N1019A user-defined application expands the capability of the existing N5467A user-defined application for Agilent's real-time oscilloscopes to include the 86100D DCA-X. Users can create their own tests, automated test groups, test limits with descriptions, measurement configurations, and customized reports. "We are pleased to expand the rich offering of Agilent compliance and test applications to the 86100D DCA-X oscilloscope," said Jay Alexander, vice president and general manager of Agilent's Oscilloscope Products Division. "Developers are working quickly to create and launch new devices to accommodate higher data rates, and they will appreciate the significant improvement in test times offered by these new applications." The new applications for 86100D DCA-X oscilloscope provide design and validation engineers with a fast and easy way to verify physical-layer transmitter compliance to the appropriate standards. Provides automation of the nearly 120 tests in the OIF-CEI 3.0 agreement, including eye, waveform, jitter, return loss and resistance tests. Supports use of Agilent's 86108B precision waveform analyzer, other dual-electrical receivers, clock recovery and precision timebase products, and Agilent's precision network analyzer family. Enables fast de-skew of cables and automatic determination of optimal peaking values for continuous time linear equalization. Displays the results in a flexible report format. Provides a margin analysis that shows how closely a device passes or fails each test. Enables fast creation of multiple tests on the 86100D DCA-X oscilloscope and other equipment. Takes full advantage of the SCPI recorder feature within the FlexDCA interface. Supports interfacing with the device under test for sequencing and control. Enables testing against compliance limits and reporting of pass/fail margins. Displays results in a flexible report format. Engineers designing and verifying OIF CEI 3.0 devices also can use the Agilent J-BERT N4903B high-performance serial BERT for physical-layer receiver compliance testing and characterization. Agilent's 86100D DCA-X oscilloscope and plug-in modules are ideal for OIF CEI 3.0 and other high-speed serial product testing. They offer the industry's lowest intrinsic jitter, a wide range of bandwidths, and electrical and optical interfaces. The Optical Internetworking Forum has many industry participants that jointly develop implementation agreements for high-speed serial interfaces. The OIF also hosts a series of technical workshops, booths at trade shows and interoperability sessions. OIF's current directors are employed by the following OIF member companies: Alcatel-Lucent, AT&T, Ciena, Ericsson, Finisar, Nokia Systems Networks, and Verizon. Agilent's solutions for digital applications are driven and supported by Agilent experts who are involved in various international standards committees. Experts from the Agilent Digital Test Standards Program are active in the Optical Internetworking Forum, Joint Electronic Devices Engineering Council, PCI-SIG, Video Electronics Standards Association, Serial ATA International Organization, Serial Attached SCSI (T10), USB-Implementers Forum, MIPI Alliance, Ethernet standards (IEEE 802.3), and many others. Agilent's involvement in these standards groups and their related workshops, plugfests and seminars enable the company to bring the right solutions to the market when its customers need them.